Fleas can be a nuisance and problem any time of year. 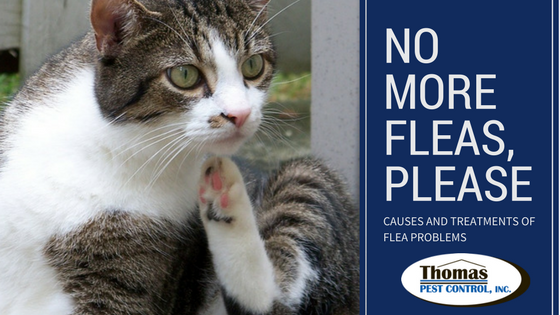 Fleas can be brought into your home on cats, dogs or even rodents who are trying to find a warm place to spend the winter months. Fleas are small, typically one sixteenth of in an inch, reddish brown, wingless, blood-sucking insects. Their bodies are laterally compressed, (i.e., flattened side-to-side) permitting ease of movement through the hairs on their host’s body. Their legs are long and well adapted for jumping and the mouthparts of an adult flea are adapted for sucking blood from a host. The female adult needs a blood meal prior to laying her eggs. Regular vacuuming lowers the number of fleas and flea eggs from carpet, cracks in wood floors, and on curtains and upholstered furniture. It also catches them under furniture. Don’t forget to vacuum the areas where your pet sleeps and eats. Empty and wash the vacuum cleaner canister or throw away bags in an outside garbage can right away so fleas don’t sneak back inside. Vacuum every day in the parts of your home where you and your pets hang out the most -- like the living room, kitchen, and bedrooms. Vacuum once a week everywhere else. If this does not eradicate the flea issue, you may want to consider treating your house with a flea "bomb" or calling in a local pest control service. Hot, soapy water kills fleas, too, so wash your pet’s bed once a week. And if your pets sleep in your bed or with your kids, make sure to wash everyone’s bedding, too. Once the house is vacuumed and the bedding is washed, give your dog a bath. Bathing your pet regularly will also help get rid of fleas in your home. Any soap will kill them, so you don’t have to use a flea bath. But make sure that the soap you use is made for animals. Some people like to end their pet’s bath with a nice-smelling essential oil that may also help keep fleas away. Skip anything with citrus, cinnamon, clove, d-limonene, geranium, tea tree, lavender, linalool, bay, eucalyptus, pennyroyal, or rue. They can cause severe allergic reactions in cats and dogs. Those that have lemongrass, cedar wood, peppermint, rosemary, or thyme are less likely to cause problems if you use only a small amount. Much of the flea problem associated with pets has been eliminated by properly applying products offered by veterinarians to pet owners. However, fleas are still out there and doing well in wildlife and rodent populations. Other pests like bed bugs, lice and mosquitoes may cause bites within a home, and therefore it is good to have a proper inspection and identification of the infestation. We recommend you contact us so that we can provide suggestions and treatments to eliminate your flea and blood sucking pest problems.